RENO, Nevada, February 12, 2014 (ENS) – A federal judge has granted two animal protection groups a unusual preliminary injunction to stop the Bureau of Land Management’s roundup of more than 330 wild horses in northern Nevada, saying the government cannot rely on a five-year-old environmental analysis that ignores claims the herd would be harmed by a pesticide given as a form of birth control. The Bureau of Land Management proposes the roundup and permanent removal of 200 wild horses in the Pine Nut Herd Management Area and the roundup of another 132 wild horses so that 66 mares can be given the chemical Porcine Zona Pellucida, or PZP, a pesticide approved by the U.S. Environmental Protection Agency as a form of birth control. Protect Mustangs and Friends of Animals, who brought the motion for an injunction, say that these wild horses belong to the most famous horse herd in Nevada, the one featured in film “The Misfits” starring Clark Gable and Marilyn Monroe, which helped pave the way for the Wild Horse & Burro Act of 1971. The two advocate groups are fighting to stop the possible obliteration of this historic herd. In granting the preliminary injunction late Wednesday in Reno, U.S. District Judge Larry Hicks said that with the proposed Pine Nut roundup, which was scheduled to begin February 20, the BLM has failed to satisfy the National Environmental Protection Act, or NEPA, and other applicable federal laws. “The court finds that the public interest will be best served by enjoining the BLM’s proposed gather, at least until the court has an opportunity to fully consider the merits of plaintiffs’ claims,” said Judge Hicks. The Pine Nut HMA covers 98,000 acres in Carson, Lyon, and Douglas counties. The BLM previously determined that the appropriate herd management level for the Pine Nut herd is between 119-179 horses. 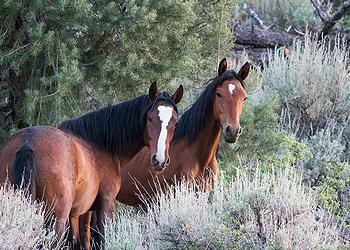 In 2010, the BLM found that the Pine Nut herd had grown to about 215 horses and proposed a roundup and PZP treatment. The BLM did an Environmental Assessment, EA, at that time, and the roundup and birth control treatments were carried out. “This proposed roundup far exceeds the intensity and scope of what was proposed under the 2010 EA,” the judge wrote. Instead of conducting a new assessment, the BLM issued a document called a Determination of NEPA Adequacy, or DNA, that relies on the 2010 Environmental Assessment to support their 2015 roundup decision. “The court is aware of the dangerous conditions in the Pine Nut HMA and elsewhere throughout Nevada caused by long drought conditions and larger than sustainable herd sizes. And it is these dangers that have caused the BLM to seek permanent removal of 200 wild horses from the Pine Nut HMA as well as fertility dosing of returning females,” wrote Judge Hicks. 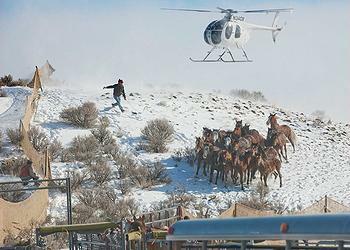 “These considerations being noted, however, the BLM made its roundup decision without conducting an adequate analysis under NEPA. The court finds an insufficient legal basis for the BLM to rely upon the 2010 EA and 2010 FONSI to support its current roundup decision,” the judge wrote. “We are delighted that the Court agreed with Friends of Animals and Protect Mustangs that BLM is obligated to fully evaluate under NEPA each and every proposed roundup,” said Michael Harris, director of Friends of Animals’ Wildlife Law Program. The federal government considers wild horses to be “pests in some situations,” the U.S. Environmental Protection Agency says in its Pesticide Fact Sheet on PZP dated January 2012. Because of federal protection, lack of natural predators and the fact that herd sizes can double in about four years, wild horse and burro herd population levels have been set at a total of 27,200 on BLM-managed lands across 10 states. “The BLM has expressed that there is an explicit need to manage wild horse and burro populations because uncontrolled populations may lead to adverse environmental effects such as degradation of wildlife and native vegetation habitat. Additionally, these populations may lead to conflicts with other rangeland uses such as cattle grazing and recreation,” the EPA states in the PZP Pesticide Fact Sheet. 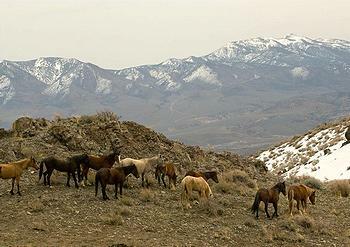 BLM says there are nearly twice as many horses on the Pine Nut Range as that high desert can support, but horse advocates say the wild horses belong there. “Today is a milestone for America’s wild horses who have been scapegoated for range damage and forcibly drugged with PZP in experiments for decades,” said Anne Novak, executive director of Protect Mustangs, a nonprofit organization based in San Francisco. “They should never live in zoo-like settings on public land. That’s not freedom. Wild horses are a native species who contribute to the ecosystem. They belong here,” said Novak. Judge Hicks also considered the “irreparable harm” that the BLM’s proposed roundup and contraceptive treatments would have on the plaintiff groups.